Here is one of my sketch study on one of the birds of prey. Here I will show you how I paint golden eagle in painting video instruction along with step by step images. In this painting exercise I am trying to get translucent color effect over a detail drawing I have. It is very similar to using water color to glaze over the tight drawing. But in the final stage, I use opaque or solid color to bring out tighter form and high light on the subject. It is a lot easier to do this technique in any digital painting program and Photoshop because you can adjust opacity or you paint and using overlay to get the transparent effect. This tutorial is the second part of how to draw golden eagle tutorial I previously posted. This tutorial is more of a quick color study or sketch rather than a finished work I usually do. Here is a final painting of a eagle. Here is a video instruction how to paint golden eagle. 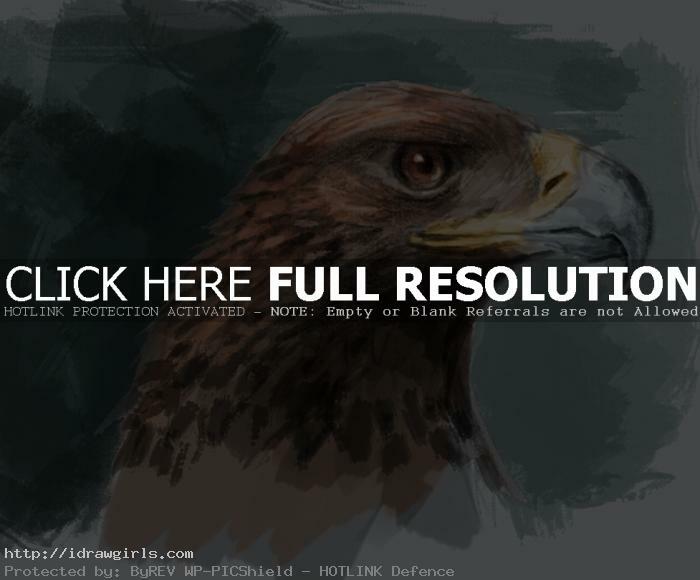 Here are step by step images show you how to draw golden eagle.